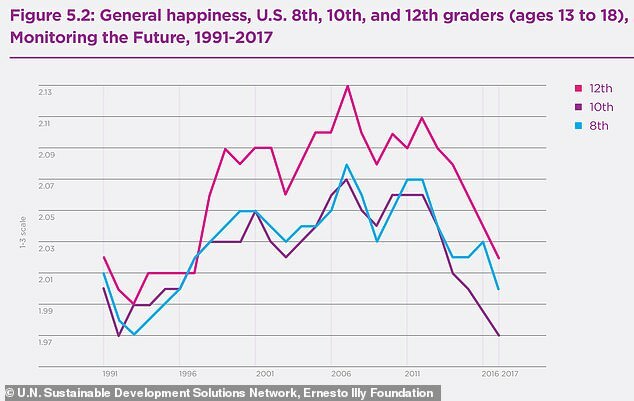 The United States is becoming a less happy place to live and now there's research to prove it. The 134-page report noted that, in general, happiness levels have decreased worldwide despite continued economic growth. That's partly explained by 'dramatic falls' in happiness in population dense countries like the United States, Egypt and India, it said. On a scale of 1 to 3, where 1 represents 'not too happy' and 3 means 'very happy,' Americans on average give themselves a 2.18 — just a hair above 'pretty happy.' 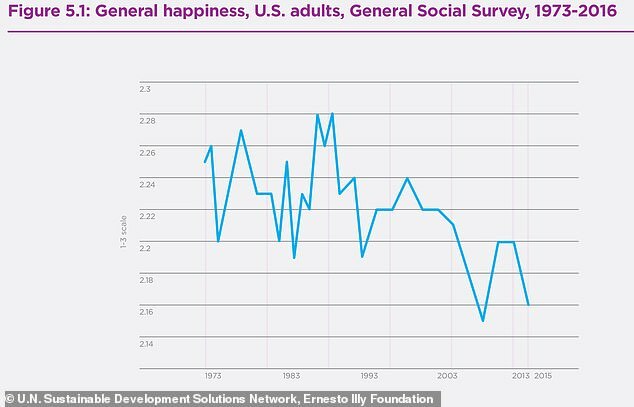 That's a significant decline from the nation's peak happiness, as measured by the survey, of the early 1990s. The change is driven by the number of people who say they're not too happy: 13% in 2018 compared with 8% in 1990 which is more than a 50% increase in unhappy people. 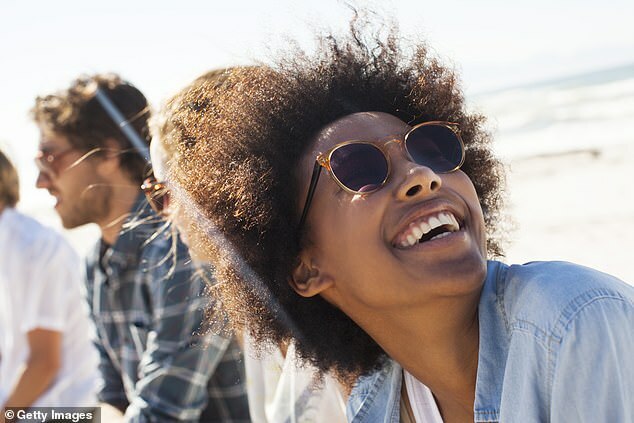 'The worldwide tendency of a considerable decline in average happiness, despite the general growth in GDP per capita, is proof that measuring happiness and life satisfaction in terms of economic wealth alone is not at all sufficient,' said Meik Wiking, CEO of think tank The Happiness Research Institute in Copenhagen, Denmark, who took part in the report. 'The divide between rich and poor also creates an erosion of the cohesion and trust between people, which is so vital for the feeling of safety and security and therefore for the overall happiness level of the American people,' Wiking said. 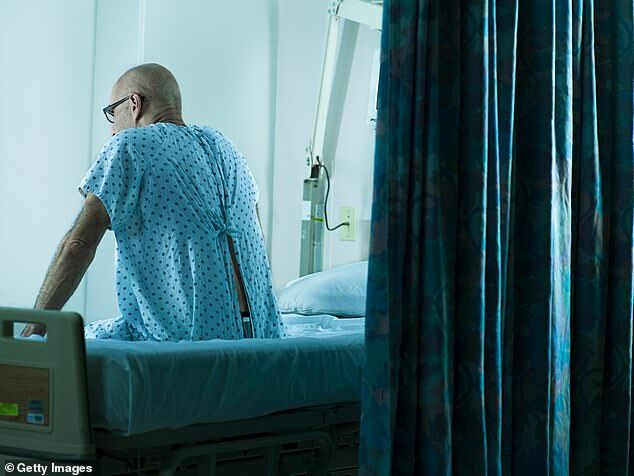 'By most accounts, Americans should be happier now than ever,' wrote Professor Jean M. Twenge from the San Diego State University, referring to low U.S. unemployment and violent crime rates, improved living standards and income level. 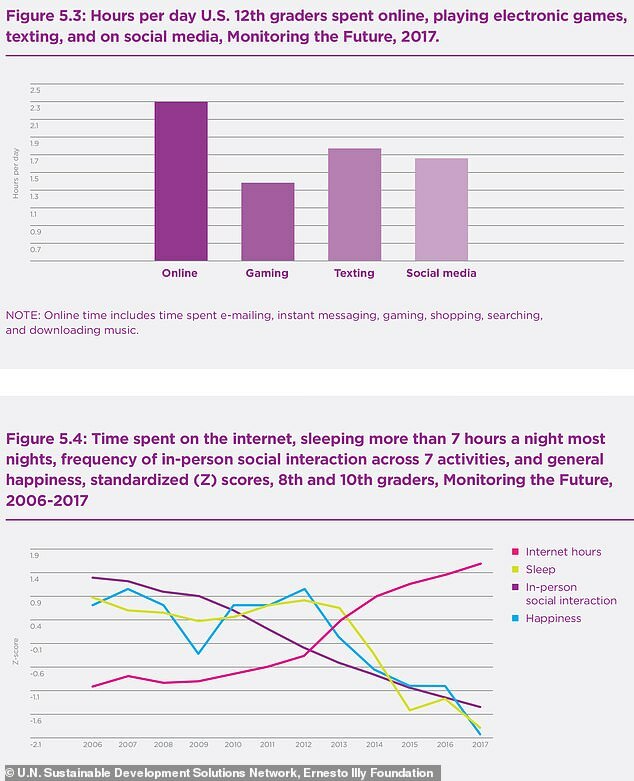 'This year's report provides sobering evidence of how addictions are causing considerable unhappiness and depression in the U.S.,' the network's director Jeffrey Sachs said in a statement, adding that they were referring to addictions in many forms from substance abuse to gambling and digital media. The urban-rural happiness gradient also is shrinking. In the 1970s, the residents of rural areas were about 10% happier than those living in cities - but now the numbers are much closer, likely because of the strong preference for urban life among millennials. The index showed the other Nordic countries did well again this year, with Denmark, Norway and Iceland taking the next spots. The remaining top ten nations were The Netherlands, Switzerland, Sweden, New Zealand, Canada and Austria.